For decades, refrigerators had single-speed compressors that were always either off or on. A compressor is the engine that powers the refrigeration cycle, moving refrigerant through the inner and outer heat exchange pipes. With a single-speed compressor, when the temperature inside the fridge reaches above a certain temperature, the compressor suddenly switches on – a noise almost everyone is familiar with. The single-speed compressor operates at full power, producing enough cool air until the temperature has sufficiently decreased before abruptly shutting off. Enter the digital inverter compressor (a compressor that can operate at variable speeds because it is operated with a digital inverter). Unlike the standard single-speed compressor, which is either off or operating at full speed (typically about 3,600rpm), the digital inverter compressor is almost always on, but can operate at different speeds – from 1,100 to 4,300rpm. This ensures high efficiency and consistent temperature inside the refrigerator. It also results in significant cost savings, a reduced carbon footprint, less noise and a longer lifespan for the compressor. The digital inverter compressor is one of the most important innovations in the history of refrigerators and food preservation and Samsung has led the way. Today, digital inverter compressors are the main technology used in Samsung’s signature refrigerators, including those that are part of the Chef Collection, the T9000, as well as food showcases and large-capacity premium refrigerators. 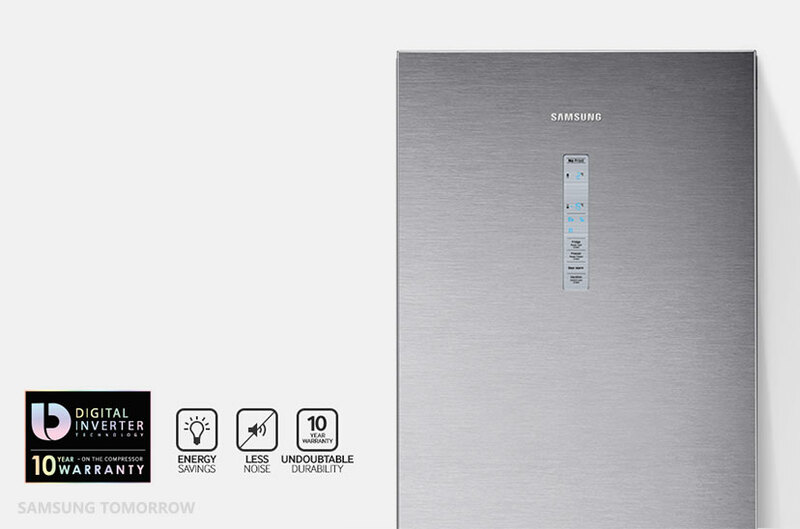 This has played no small role in Samsung’s ascent to become the world’s top refrigerator manufacturer. In addition, Samsung has become a technical leader, as one of the world’s top manufacturers of this game-changing technology. Samsung produced more than 40% of the world’s digital inverter compressors in 2014 as other major manufacturers now use Samsung’s superior compressors in their refrigerators. Samsung really began its rise in this area in 1999 when the company pushed investment in BLDC (brushless direct current) inverter compressors. Since then, Samsung has continued to expand its investment in research and development, hiring a highly skilled team of researchers, which has enabled the company to remain on the cutting edge of technology. From 2000 to 2014, Samsung sold a total of 27.5 million BLDC inverter compressors, which are highly efficient and less noisy compared to a single-speed induction motor compressor. BLDC motors are also better in terms of reliability and longevity. The current Chef Collection refrigerator employs a fifth generation technology of BLDC inverter compressor. The benefits are obvious. A refrigerator with a Samsung digital inverter compressor consumes up to 46.9% less energy than a single-speed induction motor compressor, and thus contributes far less in the way of greenhouse gases. Because the digital inverter compressor gradually speeds up and slows down, it does not have to work as hard to manage the temperature. This means that refrigerators with digital inverter compressors suffer less wear and tear on components and are therefore far more durable than fridges with conventional compressors. This has allowed Samsung to offer a 10-year warranty on its digital inverter compressors. The lack of abrupt starts and stops means no sudden, potentially startling disruptive noises interrupting you dinner. Digital inverter compressors are also far less noisy overall: up to 3 decibels quieter. And the consistent, uniform cooling that maintains the desired temperature means food lasts longer because changes in temperature can lead produce, meat, fish and dairy to spoil more quickly. It all means that consumers will save money on both their electric bills and food costs. When Samsung sought input from its highly influential group of culinary experts, also known as the Club des Chefs, they emphasized that temperature uniformity is a crucial component of any fridge that may be used in a Michelin-starred kitchen. Chef Collection refrigerators boast “Chef Mode,” which ensures that the temperature fluctuates no more than plus or minus 0.5 degrees celsius. The Chef Collection refrigerator is equipped with three evaporators and two compressors to control humidity. It is also made of stainless steel panels, which help to keep the temperature consistent.